The City of San Diego is currently drafting a planning document for the area around the Balboa Avenue Station. Eventually, the plan will be voted on by the San Diego City Council. The current draft plan is can be read on our campaign page and shows the area being included in the plan. 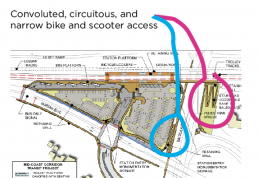 Want to get involved with BikeSD’s campaign to get better bike facilities at the Balboa Ave. station? Add yourself to our mailing list to get the latest updates. Better yet, join BikeSD as a member today!